Oh dear me. It’s happened. I knew it would. There are two days here where I used my father’s camera, then went back to Bathurst, and now I don’t have any pictures for those two days. So let me owe you two and let’s move on. This picture sponsored by Colonel Sanders? I’d say I wished that was the case, but I couldn’t handle eating KFC every day. It’s the kind of food where you gotta let the memories die before you want it again. 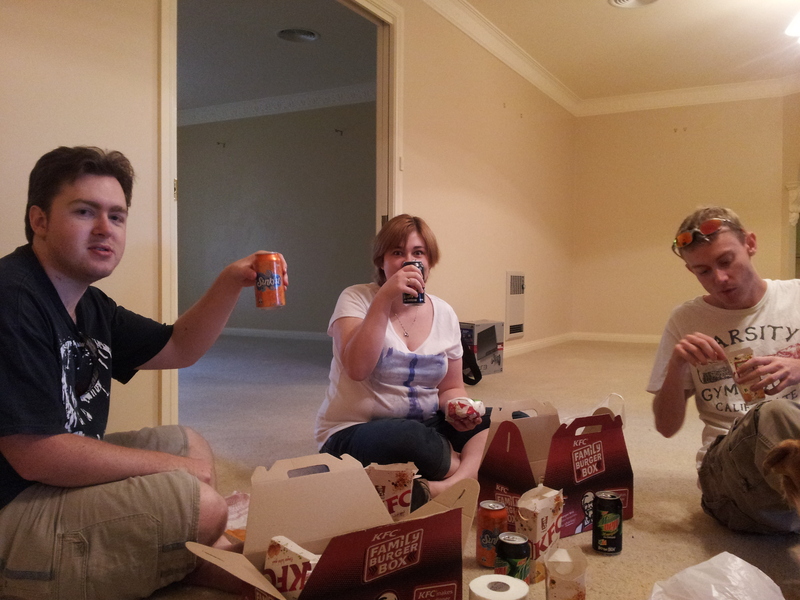 Anyway, from L-R, Spud, Lydia, Ryan, our impromptu toilet roll/ hand towel in front. Spud and Lydia are our new house mates, along with Richelle from the apartment. Not pictured in this photo but definitely present is Sax, so there are six of us sharing a house. Sax doesn’t get to vote in household decisions, but neither does he have to do chores, so that’s a decent trade off. That’s it for moving (today, anyway). Always remember, there is no greater symbol of friendship than someone who helps you move house. This entry was posted in Photo a Day and tagged bathurst, friends, lost pictures, lunch, moving, moving house, new house, soulless accidental product placement. Bookmark the permalink.